Constituents: glycosides (including a red pigment, hypericin), flavonoids, tannins, resin, volatile oil. Preparation Methods & Dosage :St. Johns can be taken in teas as a general nervous system tonic, standardized capsules and tinctures are most often used in treating depression. 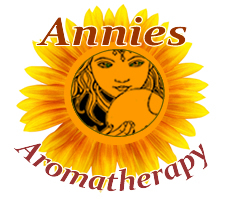 St. Johns Wort oil is used as an external skin treatment. 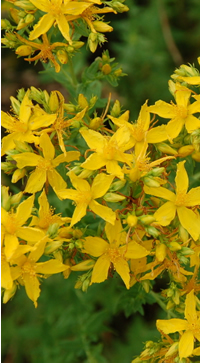 St. Johns Wort Side Effects: St. Johns can alter the physiologic impact of MAOIs and SSRIs. St. Johns is a sun loving, shrubby perennial whose yellow flowers bloom in the summer. You can grow direct from seed or transplant. The plant reaches a height of 1 to 2 feet and needs about a foot a space around it. St. Johns is considered an invasive weed that can cause trouble to livestock, so while a few garden plants are easy enough to keep contained, be careful of trying to grow it in situations where it could escape cultivation. 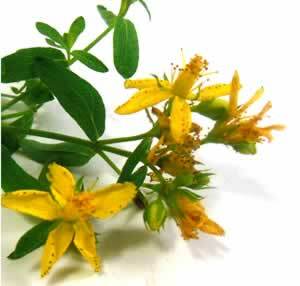 St John's wort is effective as a compress for dressing wounds. In the Middle Ages it was commonly used to heal deep sword cuts. There are many ancient superstitions regarding this herb. Its name Hypericum is derived from the Greek that means 'over an apparition', a reference to the belief that the herb was so obnoxious to evil spirits that a whiff of it would cause them to fly. If you pinch the leaves or the petals they give out a reddish purple stain- the "blood of St. John". Keeping this herb in your garden will protect you from fairy trickery. Carrying a few stems of the foliage was an old way to avoid being "fairy-led", or lost and confused while wandering through the local enchanted forest.